Israel has caught election fever. Last October, Prime Minister Netanyahu announced that he was rescheduling the next national elections for January 22, 2013. Since that day, parties from across the political spectrum have jockeyed for position in the public’s favor. Recent polls confirm what many Israelis have known for years. The religious right is gaining influence. In fact, the single biggest story of this election has become the meteoric rise of settler-hero and conservative icon Naftali Bennett. He advocates the annexation of areas in the West Bank and he favored a ground invasion of Gaza during Operation Pillar of Cloud. Netanyahu and the new Likud Beitenu party he formed with Avigdor Lieberman are still projected to win handily. However, Bennett has pledged to join a Netanyahu-led coalition after the election, so each percentage point he climbs in the polls wins him more influence in the future ruling coalition. As in all aspects of public life, the veering Israeli political discourse has very little presence in Nazareth, the capital for Arabs in Israel. Palestinian Arabs would never vote for Naftali Bennett’s Habayit HaYehudi party (“The Israeli House”). He comes from an ideological school similar to Meir Kahane, the radical rabbi whose most famous scion, Baruch Goldstein, famously murdered 29 Palestinians in Hebron in 1994. Needless to say, Bennett’s rise does not mean an end to the increasing flow of discriminatory legislation, which has further abused the rights of Palestinians in the last few years. The democratic process functions, but Palestinian citizens have such extreme positions (relative to the mainstream discourse) they have been pushed from political viability. Winners and losers are chosen by Jewish Israelis, but in Nazareth the elections are still a big event. With all that in mind, what do national Israeli elections look and feel like in Israel’s largest Arab city? First things first, how do Israeli elections even work? When an Israeli citizen walks into her voting station on Election Day, she will see a ballot with a list of parties on it, not names. That is because Israel has a proportional representative system. Each party chooses a “list” of candidates that best represent their collective beliefs and people vote for a list. Traditionally, lists are comprised of candidates from a single party, but in the past multiple parties have submitted joint lists. This is the case with current Likud Beitenu list. Netanyahu’s Likud and Lieberman’s Yisrael Beitenu agreed to run on a joint list for this election. Citizens vote by list and the amount of seats a party wins is based on their list’s percentage of the vote. Parties like Shas, Likud Beitenu, and Yesh Atid are projected to win a large percentage of the vote, so they publicly campaign with long lists of candidates. For example, Likud Beitenu is polling at 28.8%, which would earn them 34.5 seats in the Knesset. That alone is not enough for a ruling majority. After the election, there will be a period of negotiations that will form a ruling coalition. So, despite Netanyahu’s party only capturing 34 out of 120 total seats, he will be able to organize a coalition of right wing parties and run the Knesset with over 70 members of the Knesset (MKs) behind him. For the Palestinian minority, the minimum requirements are a more relevant function of the proportional representation system. You see, there are many more political parties in Israel than those currently holding seats in the Knesset. These are parties that win less than 2% of the popular vote. 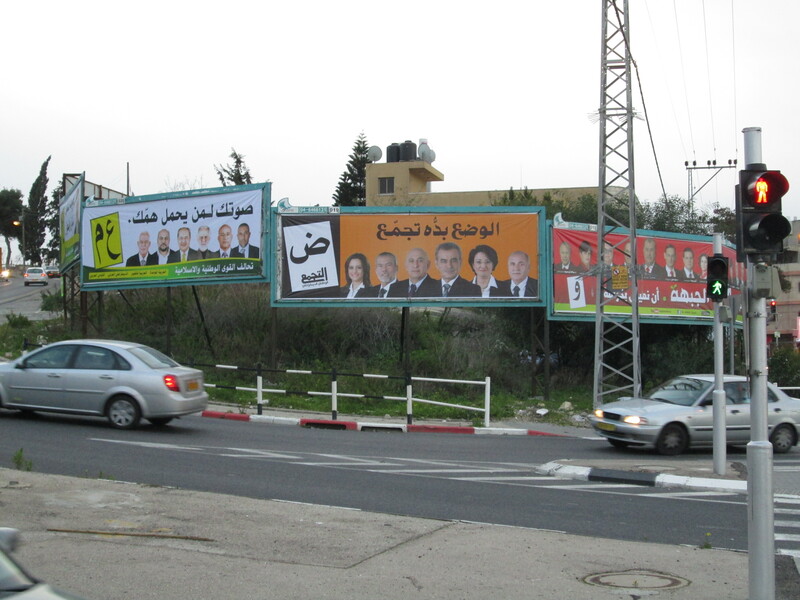 There are three Arab parties with seats in the current Knesset: The United Arab List (Raam-Ta’al), The National Democratic Assembly (Balad), and The Democratic Front for Peace and Equality (Hadash). Each of these three promotes non-Zionist views and purports to serve the needs of the Palestinian minority. Ta’al and Balad are purely Arab lists where Hadash is an Arab-Jewish communist party. In the current Knesset, the United Arab List has three seats, Balad has three, and Hadash has four. So, when the Arab parties campaign, they have much shorter lists than Likud-Beitenu. 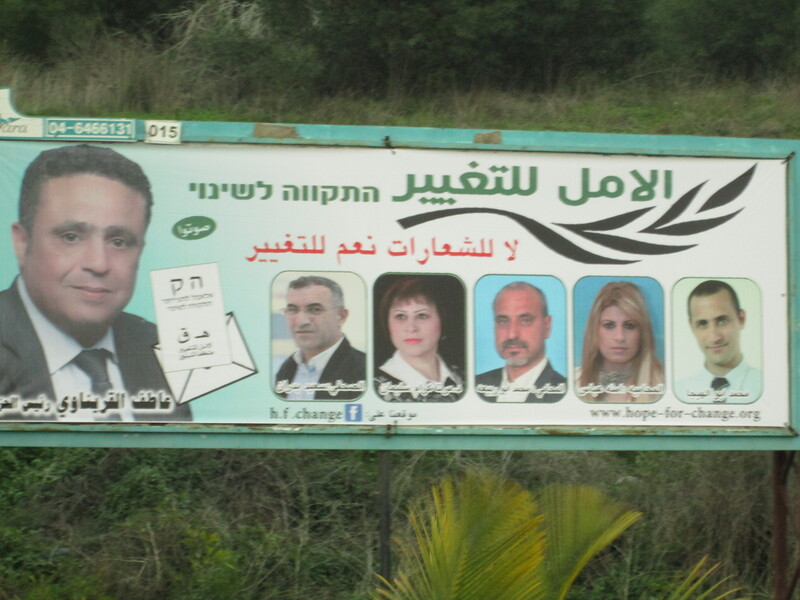 Hadash, for example, has seven faces depicted on their campaign posters. I thought 20% of Israel’s citizens were Palestinian, why aren’t Arab parties winning more seats? It’s true, there are 1.5 million Palestinian citizens of Israel, yet their favored parties only win ~9% of the Knesset’s seats. The numbers don’t add up. American readers may be quick to explain away the dissonance with apathy. The real reason why there are not more Arab Knesset Members is the Arab boycott. The history of Palestinian citizens’ voting trends mirrors the history of the Arab/Israeli conflict. In the beginning – from the war in 1948 to the war in 1967 – Palestinian citizens lived under martial law. There was a separate court system for them, curfews were in effect, and travel permits were a necessity. Even under those strict rules, the early secular Zionists awarded many Palestinians living in Israel citizenship. The peak voter turnout for the Palestinian minority was 1955 when 90% of Arabs voted. From 1955 to 1981 there was a gradual increase in Palestinian voting, then a gradual increase from 1981 through 2001. In the early 1990s, the Arab parties played a critical part in supporting Prime Minister Yitzhak Rabin’s diplomatic efforts that led to the Oslo Accords. Then in 2000 the Second Intifada broke out in the Occupied Territories and Palestinians in Israel rose up in solidarity. Israeli security forces reacted with violence and 12 Palestinian citizens were killed in the protests. As a result of this harsh antagonism, the Palestinians organized a mass boycott of the 2001 elections. Since then the inequality in rights enjoyed by Palestinian and Jewish citizens has only grown and the amount of Palestinians who choose to boycott has grown with it. This coming election is projected to have fewer than 50% of Palestinian citizens vote. There are four categories that most justifications for boycotting fall into. Palestinian citizens have had more than 60 years of experience being ignored by the political mainstream. There is a common sentiment that it just doesn’t matter any more. These first two points are inextricably linked. Apathy is bred from marginalization. The marginalization of the Palestinian minority is ingrained in the fabric of Israel, due to its institutional definition as a Jewish and Democratic state. Since the massive boycott in 2001, this faction has grown larger and larger. In the months leading up to the election, Nazareth has hosted multiple high profile public events in which the merits of boycotting as a protest were weighed in a formal debate. This is a telling sign. The most important debate leading up to the elections for Palestinians in Israel was not between candidates, but between boycotters and voters. Local civil society leader and general director of the Arab Association for Human Rights, Mohammad Zeidan, is boycotting the election. He describes his position; “65 years of participation was more than sufficient for people to realize that their participation has no impact on their status. In fact, it was used by Israeli to show that it is a democracy in which the minority has the rights to be represented. The participation was used against the goal of equality in Israel.” Mohammad directed me to this video of PM Netanyahu addressing the US Congress. In it he describes how Israel is the only democracy in the Middle East and uses the equality of the Palestinian minority to defend his statement. Mohammad went on to analyze how the boycott is perceived, “boycott is becoming more legitimate as a political expression, rather than just not showing up.” The Saturday before the elections on the 22nd, there was an organized protest drive through various Arab cities in the Galilee. This event and others like it are attempts to make boycott a public act of protest. So if Palestinian citizens do choose to vote, who do they vote for? There are three major non-Zionist political parties. By that I mean these parties advocate a restructuring of the Israeli government from one based on Zionist principles to one prioritizing democracy and equality for all citizens. These parties are the Islamist-leaning Raam-Ta’al, nationalist Balad, and communist Hadash. Ta’al was formed in the mid-1990s by Ahmed Tibi. Tibi is currently the head of the party and its most outspoken member. He was a vital and ubiquitous critic of Operation Pillar of Cloud as well as a target for Zionist enmity due to his relationship with Yasir Arafat. In the 2009 elections Ta’al was running as a part of the United Arab List, but were disqualified from participation by the Central Election Commission. Tibi took the decision to the Supreme Court where it was overturned. He is on record stating, “This is a racist country. We are accustomed to these types of struggles and we will win.” This coming election will see Tibi’s Ta’al once again leading the United Arab List. 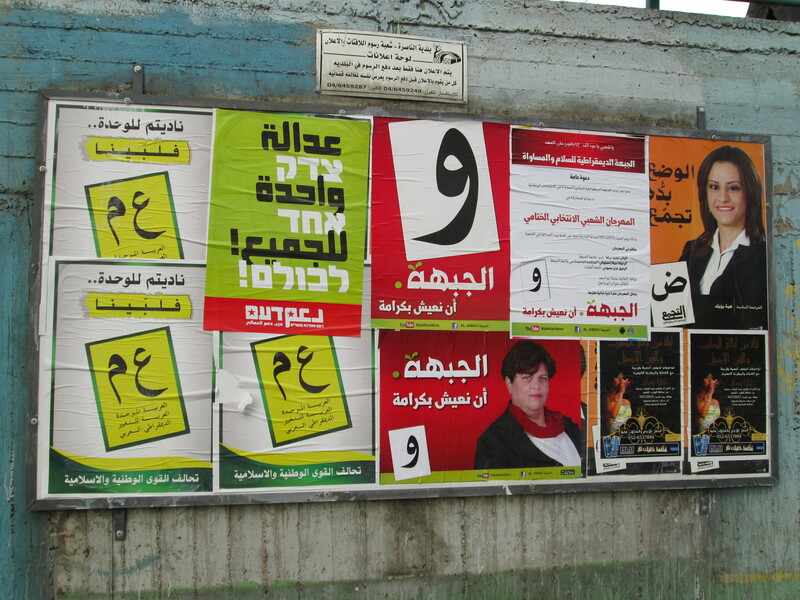 Haneen Zoabi is second from the right on this Balad poster. The character inside the white box is the Arabic letter that will show up next to the party’s name on official ballots. 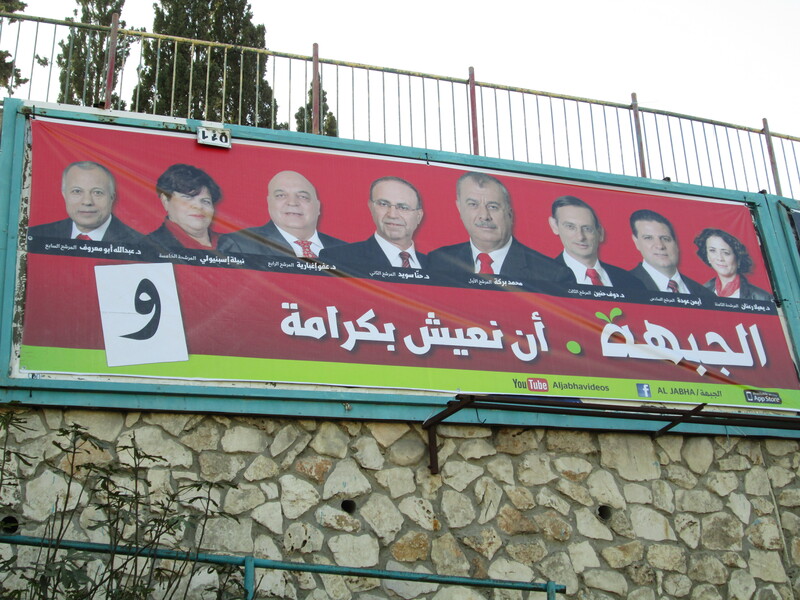 The disqualification of Haneen Zoabi was not the only legal speed bump that Balad had to hurdle in this race. The week before the election, every party is allotted seven minutes of airtime on each of the three main channels to broadcast campaign advertisements. These are opportunities to share a party message or just to familiarize the public with new candidates. Balad produced an ad featuring cartoon versions of right wing politicians singing the national anthem “Hatikva” to the tune of an Arab pop song. 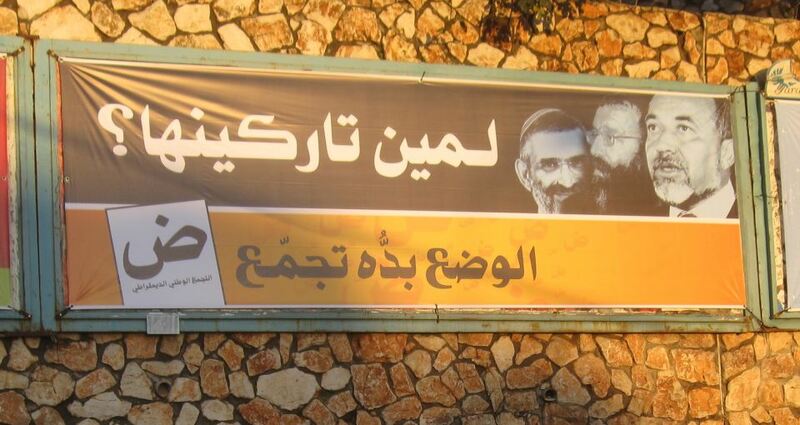 The CEC banned this ad and the ad from Michael Ben-Ari’s Strong Israel party that aired with the slogan “not an Arab country, and not a country of infiltrators.” The ruling was overturned after ACRI filed an official appeal on the grounds of free speech. If anything, the litigation controversy increased the reach of these two divisive ads. The third and final Arab party that is projected to win seats in the Knesset this election is Hadash. This is a communist party that advocated for Jewish and Arab coexistence. 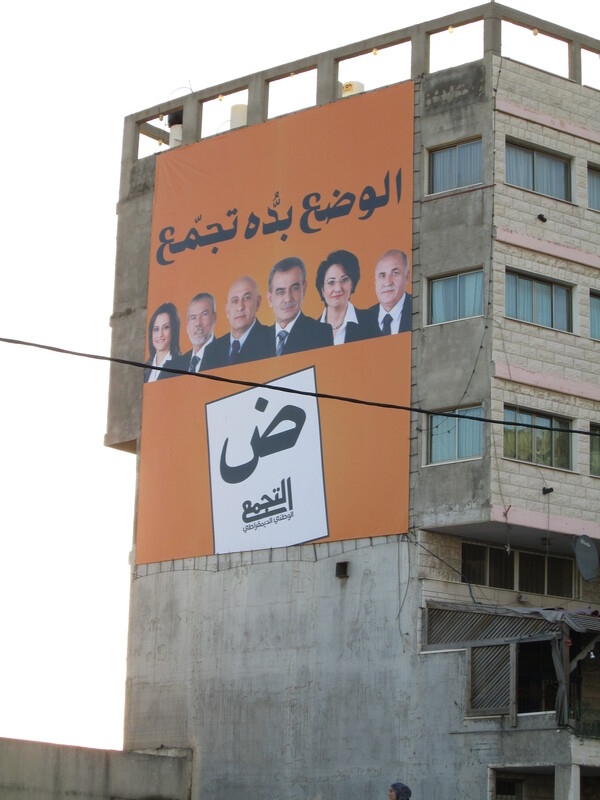 Their local branch, al-Jabha, is popular in Nazareth municipal politics and they are expected to do well here. This is the party that was co-founded by Tawfiq Ziad, the Palestinian citizens of Israel who earned fame for his “poetry of protest” and for organizing the first Land Day protests in 1976. Their party platform includes policy goals such as “achieving a just peace to the Palestinian/Israel conflict”, “protecting workers’ rights”, “eradicating weapons of mass destruction”, and “equality between the sexes”. Hadash has been criticized for a lack of women at the top of their list. These three parties have joined together to run Facebook campaigns and events in opposition of the boycott. A new Arab party is taking a different approach. The Hope for Change Party has promised to focus only on domestic issues and has pledged to join any ruling coalition. They are not projected to win any seats in the Knesset. In a last minute reaction to poor polling data, the Hope for Change Party has pulled out of the election. One of the few Hope For Change posters to be found around Nazareth. Those three parties are fairly well established in Nazareth and their roots run deep. So, this election will not be a revolutionary or game changing opportunity for a new face to make an impression. Unfortunately, the Palestinian minority faces an increasingly hostile opposition in the Knesset. Constant threats to ban Arab parties from participating, racist incitement from other MKs, and a deluge of discriminatory legislation all increase the antagonism and apathy felt by Palestinian citizens. That combined with the divisions within the minority and the constant refusal of Zionist parties to invite Arab parties into their coalitions all contribute to the seemingly implacable status quo and the stagnant struggle for political rights. The question is, if change won’t come this election, what are the prospects for the future? In other words, what do young people living in Nazareth think? Shadi Saleh Mari turned 18 this year. He was born and raised in Mashhad, a village near Nazareth, and is already an accomplished actor. He describes a divided youth, “The parties have summer camps for kids. I went to the tajamu camp when I was younger. We sang the party songs and made friends. Now teenagers use more energy on the elections than on policies. My friends and I went to see mayor Ramiz Jeraisy give a speech on breast cancer awareness. Mayor Jeraisy is Jabha and my friends are Tajamu. Before Ramiz even started to speak, my friends were already heckling him. They didn’t care what he had to say because he was from a different party.” The strong relationships and communities that have developed around the different parties reflect the natural internal divisions within the minority and cripple the dream of an impactful unified Arab list. For this, and other reasons, Shadi is choosing to boycott the election. One young Nazarene, Maroun Maa’lous, has a different perspective. He is also 18, so this will be his first election too, but he is happy to vote on Tuesday. Maroun thinks boycotting is useless, “if you don’t vote, you don’t have any influence. I think the Israeli government is interested in the non-Jewish citizens votes. A non-vote is like a vote for who you do not like. The party I vote for has done a lot. I grant them my vote for their good work. He plans on voting for Hadash on Tuesday. “Hadash is the only Arab-Jewish party in the Knesset and the best chance for peace.” Specifically, Maroun is happy to espouse the virtues of Dov Khenin, a Jew and the third on Hadash’s list. “Dr. Hanin, he is a fighter. He fights for Arab minority rights, for immigrants’ rights, for animals, for the environment.” Hadash has four seats in the current Knesset, but with the growing percentage of boycotting Arabs, that total could fall. Dov Khenin’s future lies in the balance. These two young men present a stark contrast. It would appear that they represent two poles on the political spectrum. In reality, these two perspectives lie on the extreme left of Israeli politics. But, this is the way it works in Nazareth. The Palestinian minority has its own internal politics and Israel has its national politics; this election is poised to drive a wedge further between them.